An agricultural village situated on flat land in the Antequera Basin, between Campillos and the border with the province of Seville. The village owes its fame to the lagoon of the same name, which, in addition to its enormous ecological value as home to thousands of flamingoes and other migratory birds in winter, it is also a place of extreme scenic beauty, particularly during the annual arrival and nesting periods. The history of the village of Fuente de Piedra is inexorably linked to two locations which stand within its municipal boundaries, the lagoon and a nearby medicinal spring. The lagoon must have been used as a source of salt since prehistoric times, and, later, the Iberians and Phoenicians probably continued the tradition. From the Roman period, however, a number of relics have been found which give us a much clearer picture of man’s interaction with the local environment. 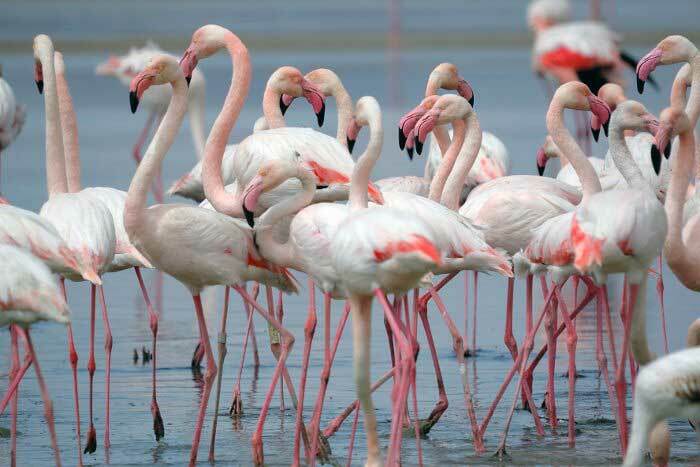 As well as exploiting the lagoon’s salt deposits, the Romans also hunted the flamingo, a bird which nests and breeds in these waters, for culinary reasons, considering the bird’s tongue to be an exotic and delicious delicacy. The spring, with its medicinal waters, which is responsible for both the origin of the village and its name, which means “the stone spring”, was also highly valued by the Romans, who gave it the name Fons Divinus -Divine Spring- in recognition of its effectiveness in treating kidney stones. Chronicles tell us that the emperor Trajano (53-117), who suffered from this complaint, even had water from the spring transported as far as Italy. The long mediaeval period is virtually undocumented, and no further records of Fuente de Piedra’s development appear until the Moslem era, important archaeological relics of which have been found to the north (Castillejos) and east (Villares) of the present-day village. In the 15th century, it was a border village between the Christian kingdoms and the Nazari kingdom of Granada, often serving as a battlefield for confrontations between the two armies and ending up practically uninhabited. The present-day village dates back to 1547, when a group of houses were built around the spring and a large number of sufferers of kidney complaints came to avail themselves of its waters; it was around this time that the area acquired the name “Fuente de la Piedra”, an allusion to the ability of its waters to combat the illness of “the stones”. On Christmas Day 1884, the village and its municipal area were shaken by the major tremor known as the Andalusian Earthquake, the serious material damage suffered including the total destruction of the parish church. The saline lagoon and the Stone Spring have enjoyed varying fortunes. The lagoon continued, albeit intermittently, to be exploited for its salt, and between 1930 and 1951 attempts were made to exterminate the flamingo colony, which was believed to be preventing the salt from crystallising. In 1951, salt exploitation in these waters was definitively abandoned. In 1981, the lagoon was acquired by ICONA (the Institute for the Conservation of Nature). In 1990 it was declared a Nature Reserve by the Andalusian Regional Government. As for the “Stone Spring”, though it continued for centuries to enjoy the therapeutic reputation which first gave rise to the village, in 1959, for reasons which are unknown, it was stemmed and buried under gardens. Written testimony exists to the usage of the village’s waters for medicinal purposes during Roman times. The lagoon was known at the time as Fons Divinus. In 1461, don Rodrigo Ponce de Leon and Luis de Pernia captured the village after the Battle of El Madroña and expelled the moors who had been living there. The foundation of the present-day village probably dates back to the 16th century and, once again, was linked to its waters. The village’s waters, its main natural and economic resource, were exported to the New World and the Kingdom of Naples.